Hi girls! This morning after much deliberation, I decided to do a themed outfit post. I'm starting to think that I need to widen my outfit looks that I make. All I seem to do is make first dates, shopping trips and going out outfits. Which is great, but I think I need to include a variety so that you guys can see something you like! So voila, I thought of doing a festival look! What do you think? I used Prodigy Red for all the items because I am currently obsessed with them! Seeing as I have zero funds at the moment, Prodigy Red lets me shop without feeling as guilty. I know we've all had that shopping guilt girls! Anyway, this is what I've come up with! 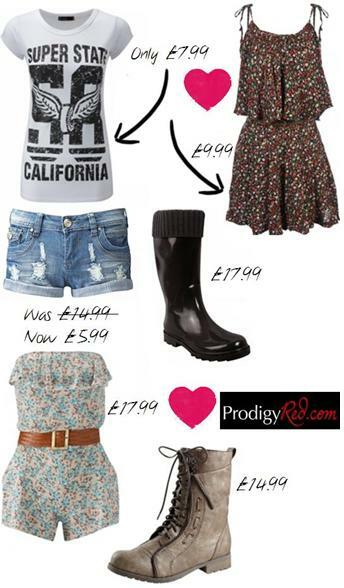 Wellington boots are essential for festivals - especially when it's been raining. What is your essential festival outfit? I've never heard of Prodigy Red before, I'll have to check them out some great bargains there! I love doing collages! so true *guilt free shopping*! love that floral romper ! esp. with the brown belt, so on trend! im gunna add this to my "beauty blog link love" over at my blog in a bit! check it out if you wanna girl!